February was better month than January. I finally fell back into a rhythm without a dreaded lurgy or cough. It seems I’m back to health again. Phew. 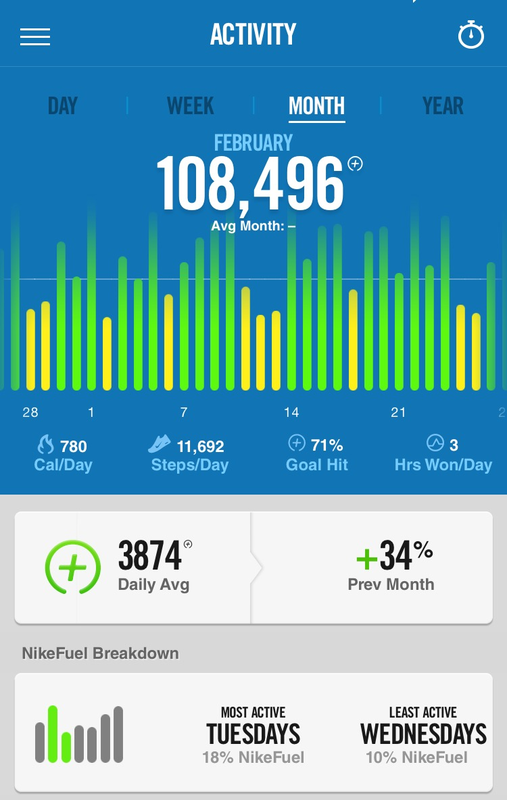 I ran a rather more respectable 105 miles in February, with an average heart rate of 140. Nice and easy. Training for the half marathon had my long runs build from around 7 miles to peak at 11.75, and now we’re ready for our half marathon on 8th March. – 4 gym sessions: 50 min spin + 40 minutes strength each time. So she’s only been doing 1 run a week, and has been getting her other cardio work (and we think, strength in her legs and glutes) through 3-4 (quite intense, 50 min) spin sessions a week. It seems like forever she’s had an issue or injury in her knee. And we think that the regular spin / bike work is maybe strengthening her legs and glutes and maybe helping balance something out. Fingers crossed it works for Sunday (Balloch to Clydebank half on 8th March). Anyway. Back to my February. 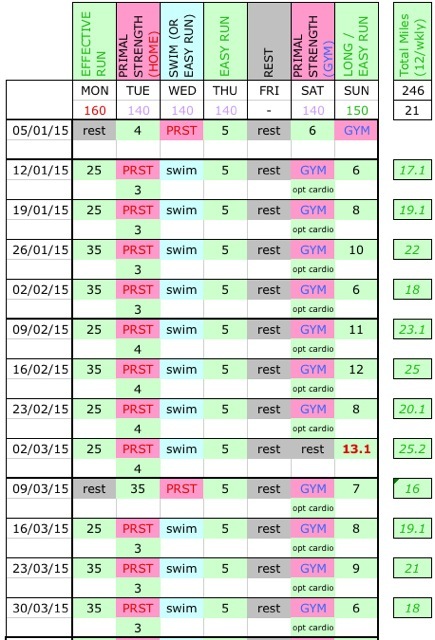 As well as building my running up with half marathon training, I’ve been doing the odd strength training session. 1-2 a week. Getting into the Gym, and strength training at home. Not as many strength sessions as I’d have liked, but ok. And good when I did them. The result of all of this activity? 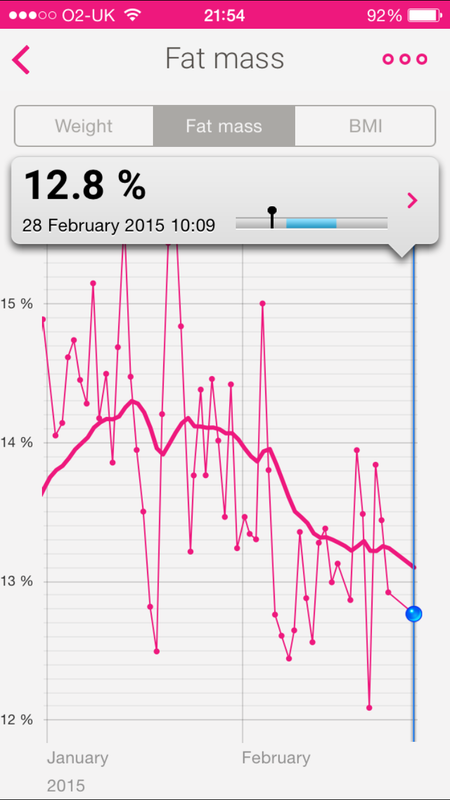 A drop in body fat % from around 14%-15% to around 13%, and a nice looking 2 month graph with a downward trend. 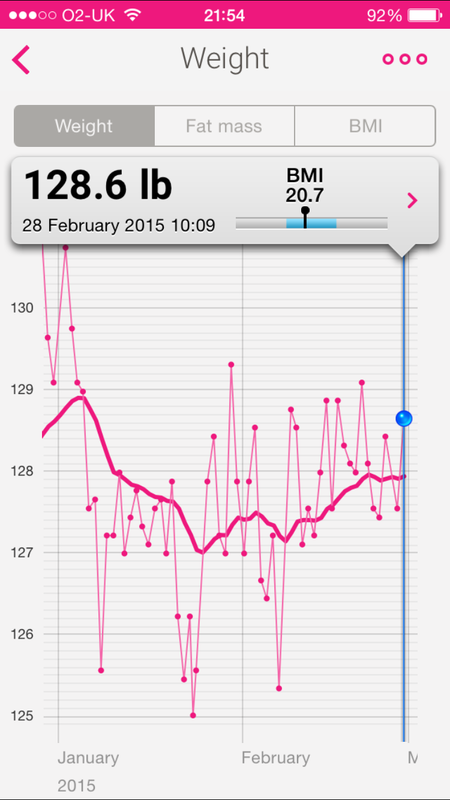 My weight seems to have increased a little, but it seems to be kind of maintaining. And body fat is more important to me than weight anyway. 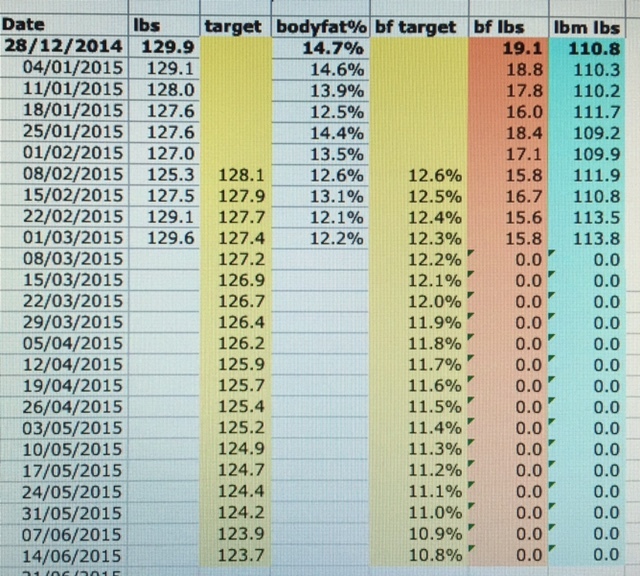 A slight decrease in body fat and a 2lb increase in lean body mass. It seems mainly from an increase in activity. 1. Do strength training 3 times a week, and running 3-4 times a week. 2. Improve what I eat (no daily Mars bars), concentrate on eating and drinking well to fuel my health and my activity. 3. Prioritise getting good sleeps for recovery. 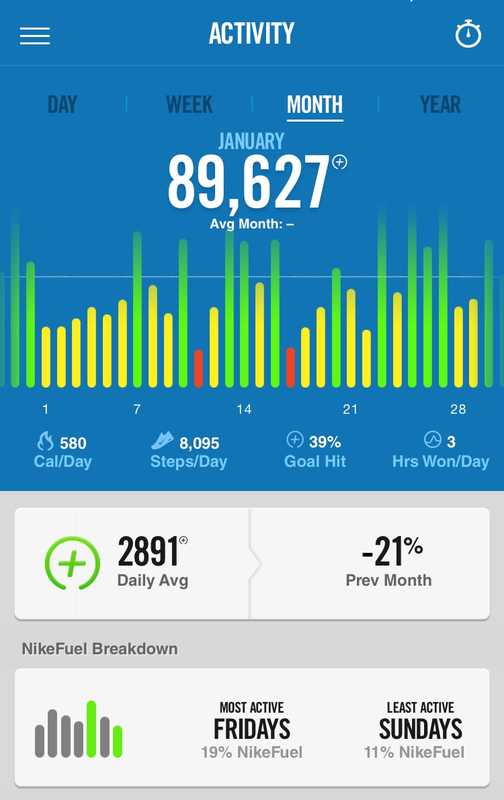 108,496 fuel points, getting my goal 18 out of 28 days. And a good increase in fuel points compared to January. 🙂 +20,000 points. Just shows again that I’m back to normal (for me). 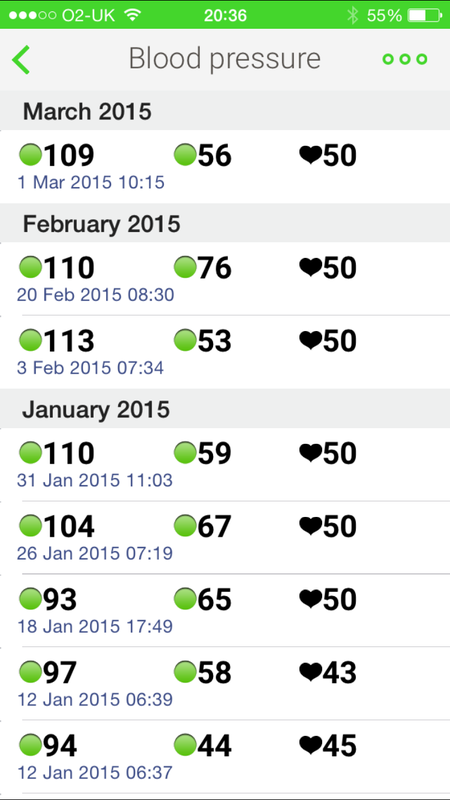 Now comes the health totals… If you remember, in October I fainted (after a workout) – low blood pressure. Nothing serious but since then I’ve been keeping an eye on it. After a bit of illness at the start of January, all of the numbers seem to be heading in the right direction. My normal BP is around 110/60 or 110/70 (ideal is 120/80). I guess a good measure is that I feel good again. Back to fitness, my heart rate is relatively low when I’m running, my BP and resting heart rate are ok.